To all you heartless people NOT following me on Twitter, *shameless* (ok lah actually I think most of you do lol) this is to inform you that as you see this, I am actually on a cruise ship haha. Will be back Friday afternoon lah... no need for tears (the shameless-ness just doesn't stop huh). Haha ok ok enough jokes. Will edit this post when I get back with the rest of the pictures! 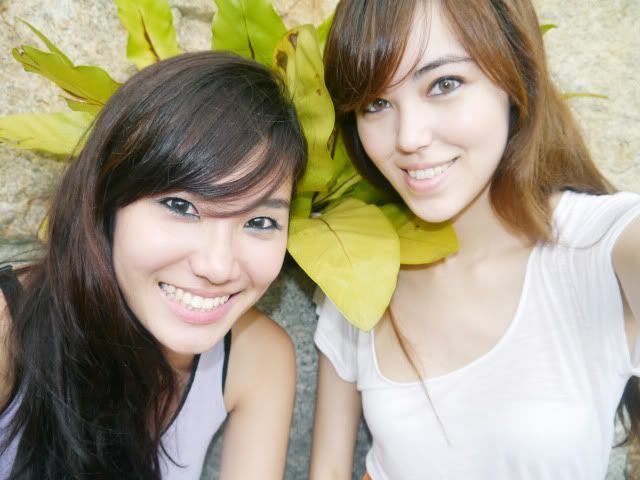 Met my friend Sherry for lunch the other day at Orchard Central! 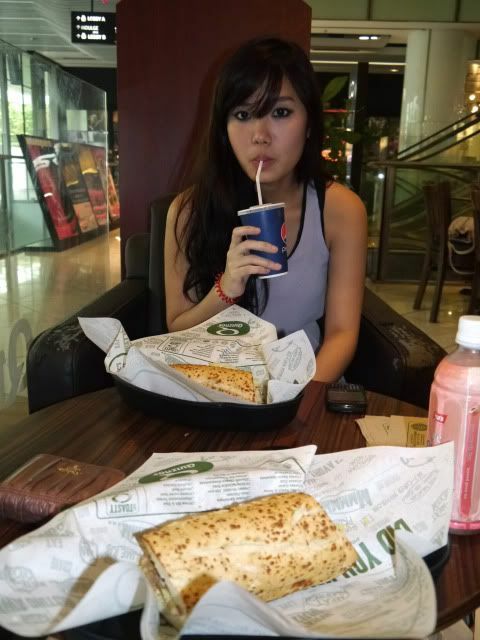 We ate at Quiznos Sub, which is sort of like Subway! The food is good! :D It's a nice change from Subway, definitely worth trying! I got the Traditional sandwich! The difference is that you don't pick veggies in the same way as Subway, so if you don't want something (Me: "Nothing but lettuce please") you have to tell them while ordering. And they have couches to sit on like at Starbucks lol. 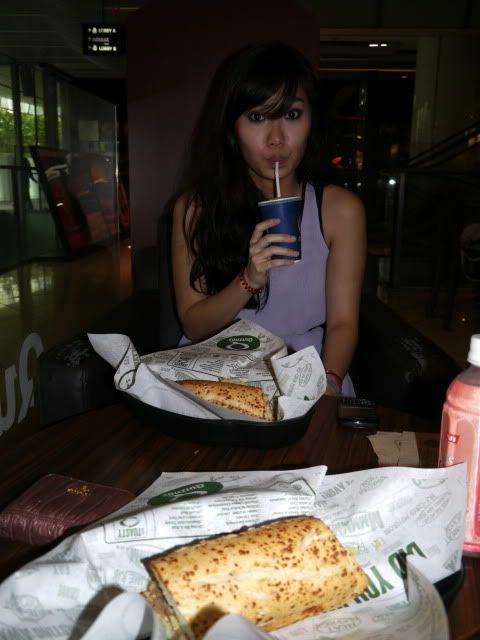 Quiznos Sub is at Orchard Central #03-33 if you wanna try! It's right beside the escalator! Lol Sherry's wearing a dress I gave her! 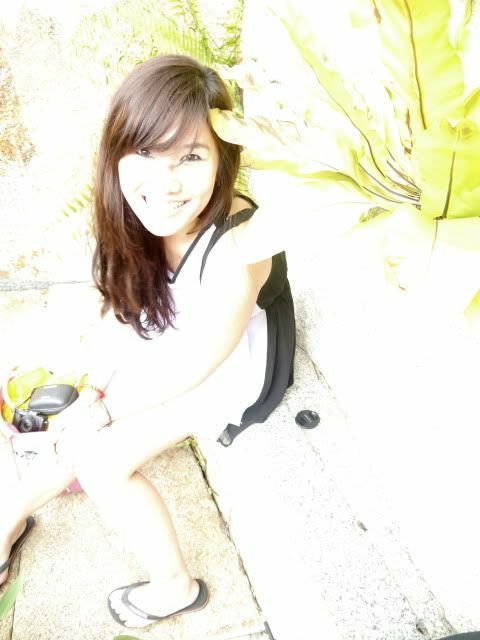 We had some time to kill before having to go our separate ways so we went up to the garden rooftop of Orchard Central! It's a good place for picture-taking ^^ Actually... it was even drizzling a little lol #vain. I'm wearing Freshkon however, and based on Xiaxue's review of coloured lenses (she gave Freshkon a pretty average rating), maybe I'm just not wearing the right brand? From her review it seems that all coloured lenses are uncomfortable though! Wow I really need to do something about my hair. Colour, hideous. Fringe, hideous. Lol testing out my camera settings! That's the pain of a DSLR (if you're on Manual mode) because you have to keep adjusting the settings based on every situation. Of course you can just use the Auto mode, but I don't always like the effect that produces. Me awkwardly standing around/walking back as Sherry snapped away. Lolol made it extra bright & high-contrasted but I still look like some kind of confused sting ray. HAIYAH. Plus the hair-flying would have been cool if my face was normal #wasted. Sigh... ok ok time to unpack my bag from the cruise! I insist that you post up the hair-flippin' picture bahahahaha. huh? you are back from the cruise? so fast? i thought go cruise takes a week? hi, what model is your grey contacts? Anonymous: See lah... don't even bother reading the like, 3 sentences I had there. There are even overnight cruises FYI. Anonymous: Uh just Freshkon Grey I guess? They don't have that huge a range. May I know where you get the orange dress that you wearing in the photos? Where did u get ur mocha coloured skirt? Frigging nice! Hi, may I know where did you get your skirt? Its really nice. where did you get your skirt from? it's lovely! Hi! where did you get your white sheer top from? Thanks!